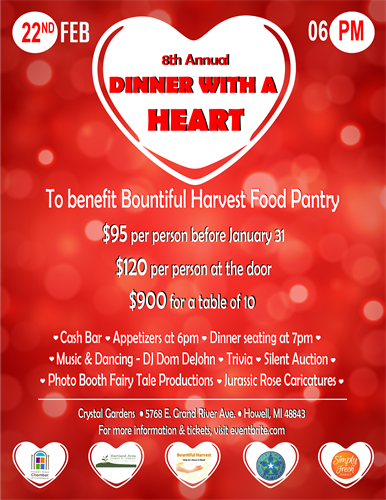 This will be Bountiful Harvest's 8th annual Dinner with a Heart - our biggest fundraiser of the year! Help support a local food pantry who is feeding the needy residents of Livingston County. The night will include a delicious sit down dinner, dancing, photo booth, silent auctions, and raffles. This is a wonderful night out for a great local cause. Appetizers served at 6pm and dinner is served at 7pm.